Disasters can close the doors of your business. Is your business ready for an emergency? The SERVPRO Franchise System offers an Emergency Ready Plan customized for your business. 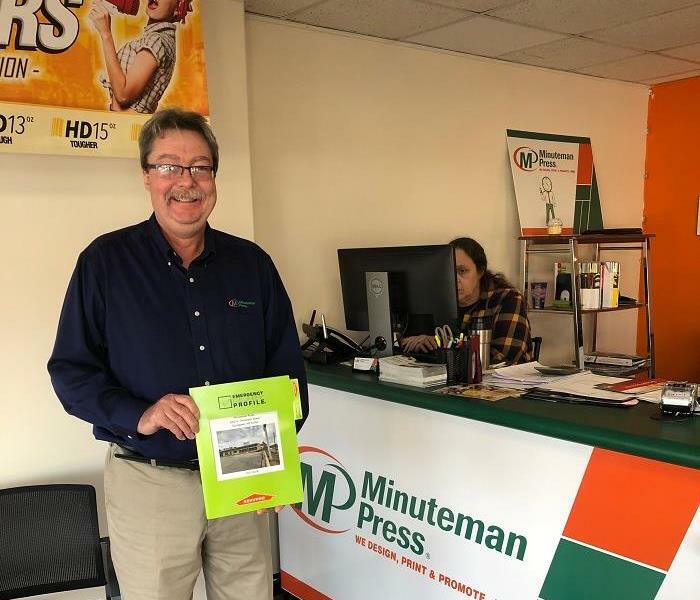 Call us, and we can create a personalized plan for you as we did for Ron Amos of Minuteman Printing in Springdale. Knowing that you have a ready-to-go course of action when the unexpected happens gives you peace of mind. Call SERVPRO of Fayetteville / Springdale today, and we can begin your business contingency planning. With his hands in his pockets, Terry G. our Operations Manager is smiling at the camera as is Super Tech, Kevin D. They know the situation is well in hand as our crew removes the graffiti from this building and not just any building. This job-site is the "Old Post Office," at the Fayetteville Square, listed on the National Historic Register. The U.S. Government indicates that this structure is worthy of preservation--so when vandalized by spray paint, the call was made to SERVPRO of Fayetteville / Springdale. We are the solution to graffiti cleanup, "Like it never even happened." 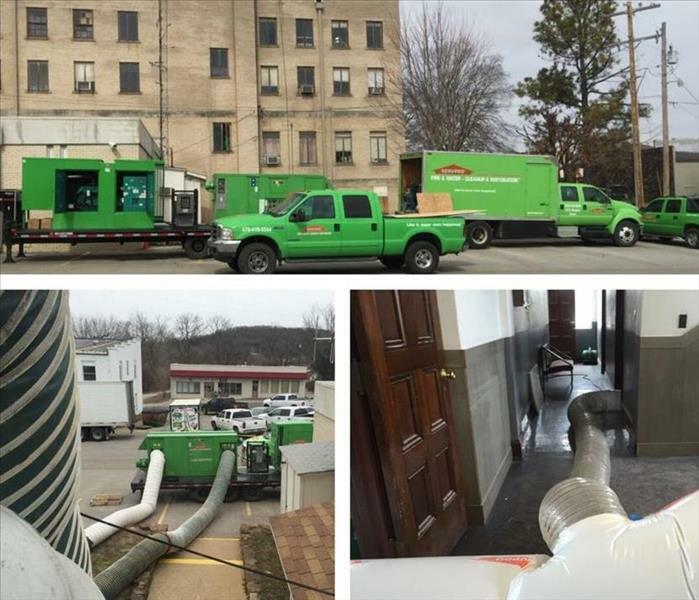 The crew at SERVPRO of Fayetteville / Springdale is your best option when it comes to commercial water damage repair and restoration. 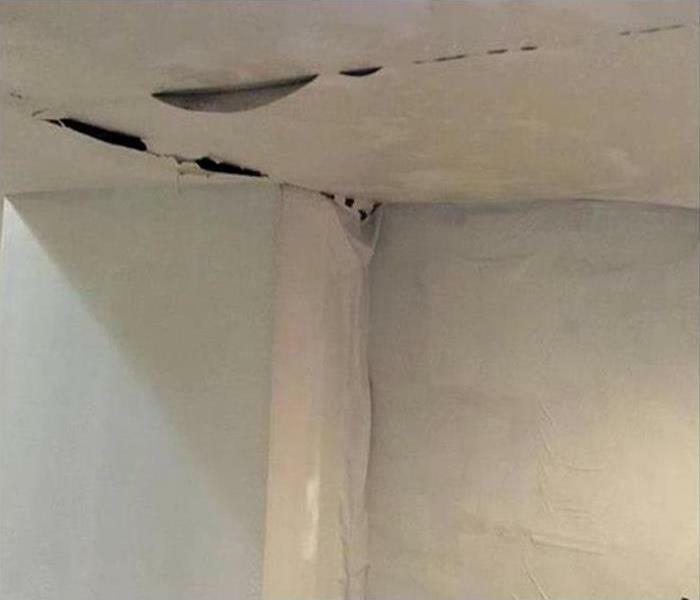 Our water damage experts have the experience, training, and equipment to restore your property to pre-damage condition. We are available 24/7, locally owned and operated, and Faster to Any Size Disaster! 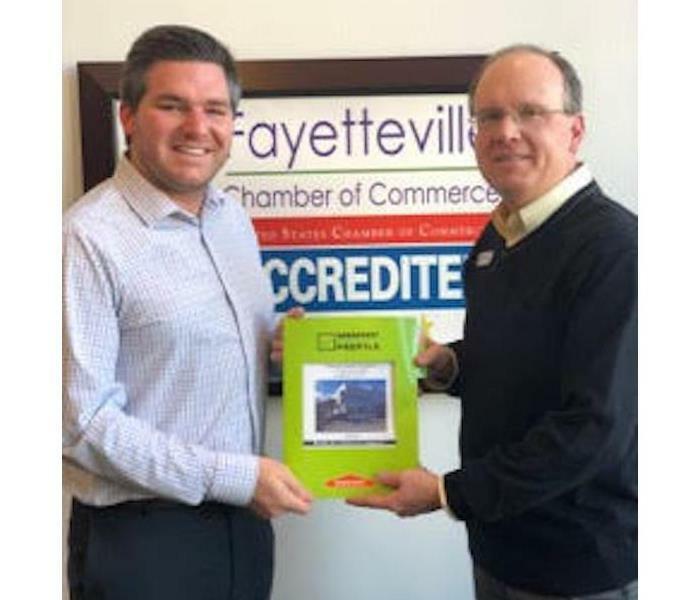 Marketing Representative, Keith Moore, met with the Facility Manager of First Church Springdale, Dan Guido, to present him their building's new SERVPRO Emergency Ready Plan Profile. The ERP is a free program that places your property's important data on your mobile device for fast access during an emergency such as a fire or flood. Go to https://ready.SERVPRO.com/ for more information or to enroll your business in the ERP program! 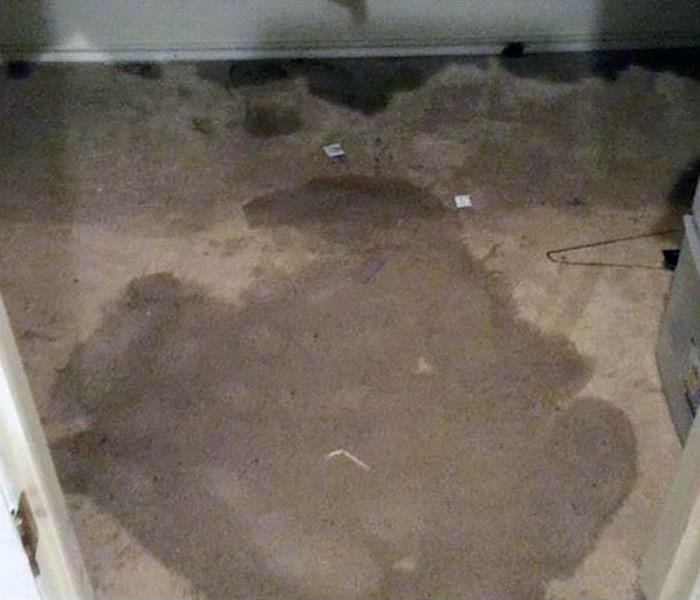 Our water damage specialists responded to a call to a property in Springdale. 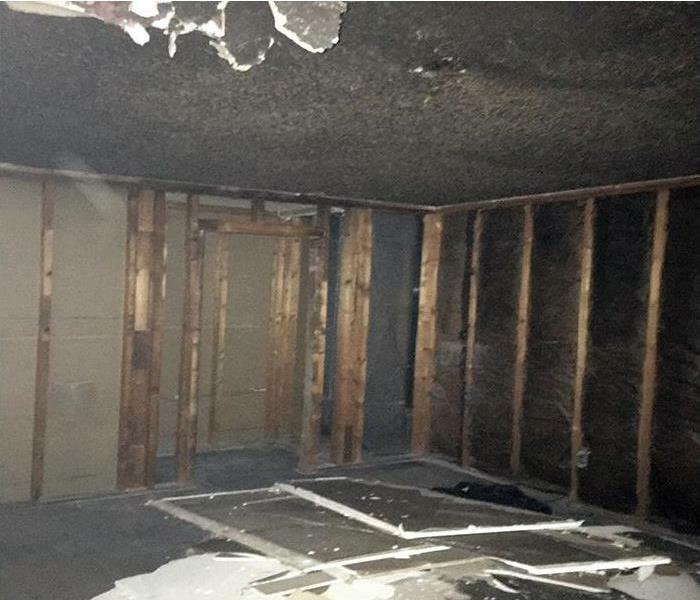 The property suffered major water damage, and our team had to work fast. Our experts used specialized inspection, extraction, and drying equipment to restore the property to pre-damage condition. SERVPRO of Fayetteville / Springdale is Faster to Any Size Disaster! We responded quickly to a fire damage emergency at a property in Fayetteville. Our fire restoration technicians begin the restoration process immediately. We used advanced equipment and specialized cleaning techniques to restore this property to pre-damage condition. SERVPRO of Fayetteville / Springdale is Faster to Any Size Disaster! 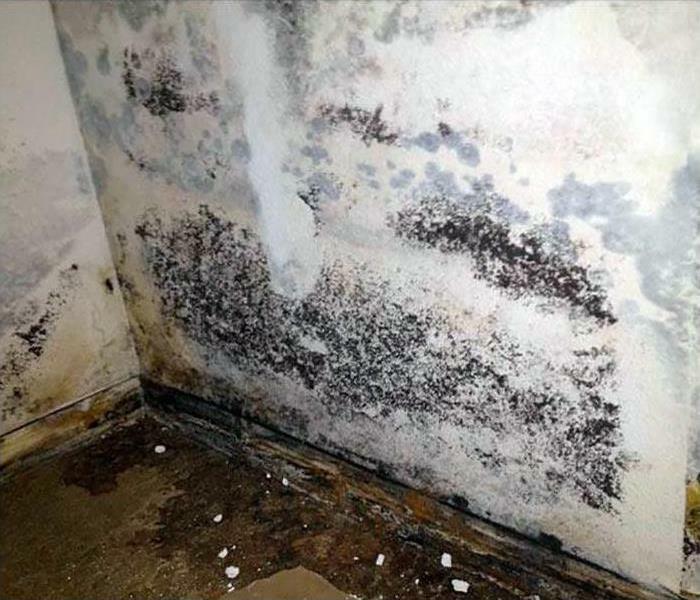 When it comes to dealing with mold remediation and restoration we need all the help we can get. 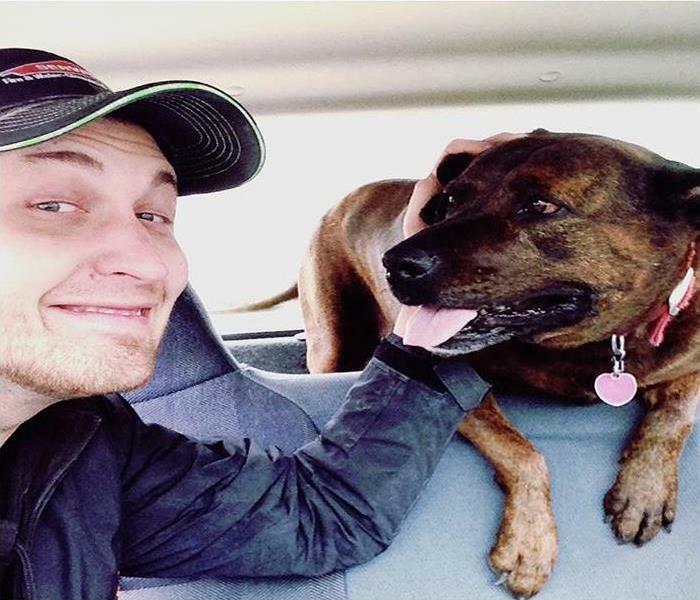 Our furry friends are a great addition to the SERVPRO family. SERVPRO of Fayetteville / Springdale values every member of the team! Our SERVPRO team member, Keith Moore, is pictured here presenting the new ERP Profile to Michael Criss, Facilities Manager of the Cross Church at the Fayetteville campus. The Cross Church recognizes the significance of having a plan in place in the event a disaster strikes. Your personalized Emergency Ready Plan profile has all the essential data regarding your commercial property in one place making it quick and easy for our technicians to help when minutes count! 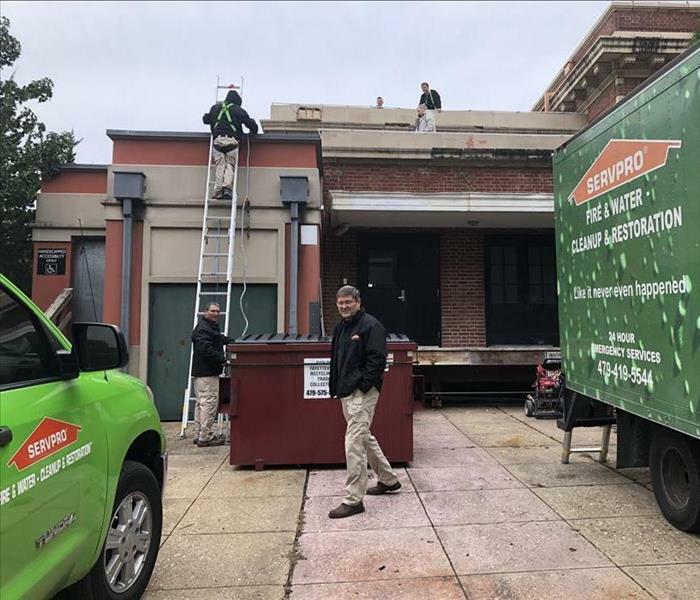 Our team at SERVPRO is getting our state-of-the-art equipment, which is the best in the industry, ready for any storm damage emergency you may have. 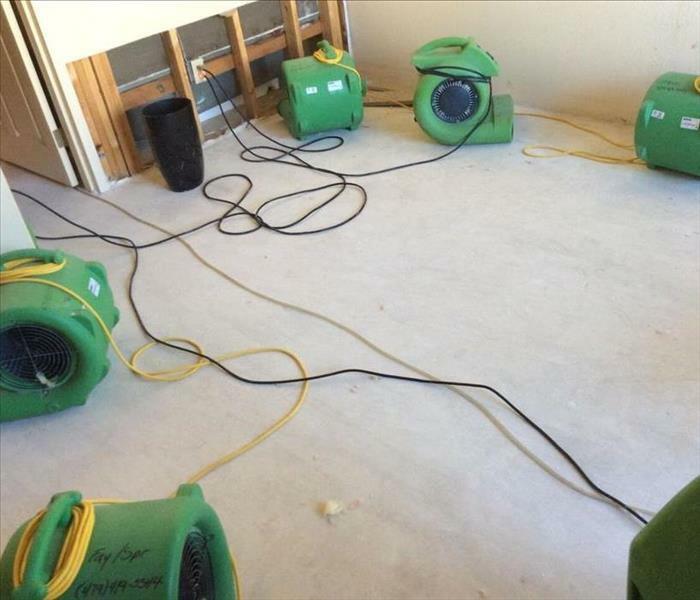 Some of our storm damage equipment includes refrigerant dehumidifiers, desiccant dehumidifiers, and high-speed air movers. 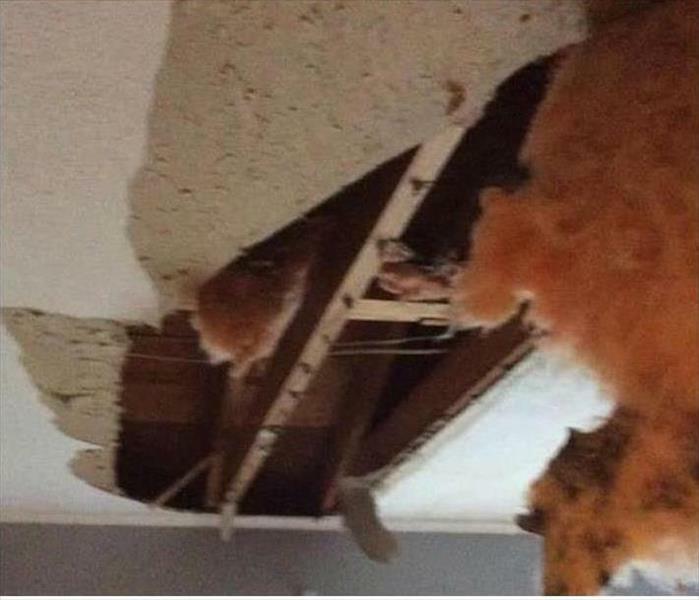 Storm damage doesn't stand a chance against our team at SERVPRO of Fayetteville / Springdale. We’re Faster to Any Size Disaster! Water can damage your home quickly, and you need a restoration company that can arrive at your house quickly. We are available 24/7 and are locally owned and operated. 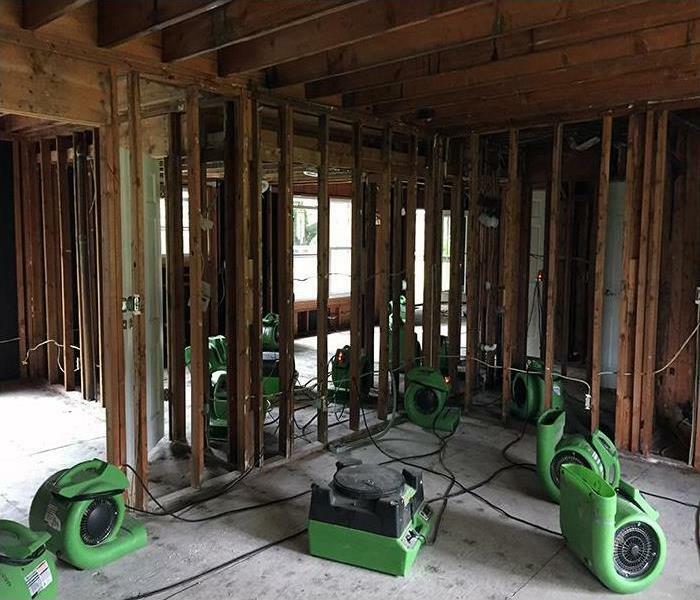 SERVPRO of Fayetteville / Springdale has the water damage experience, state-of-the-art equipment, and advanced training to restore your home to pre-damage condition. 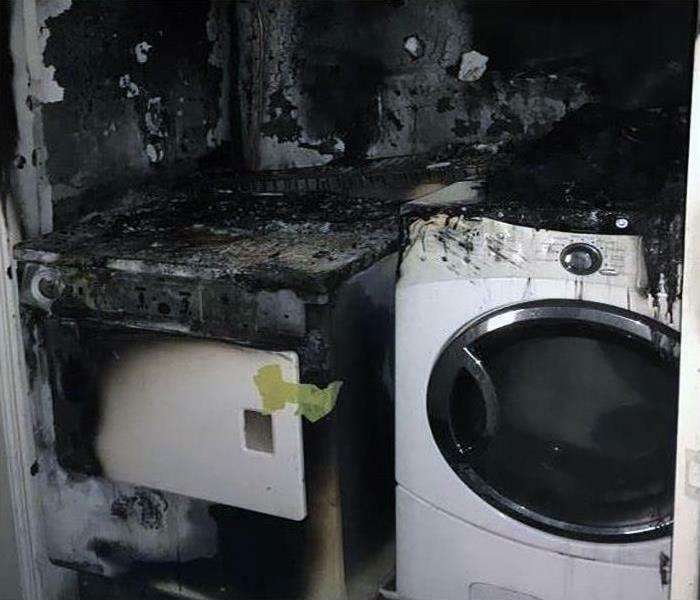 A fire can cause major damage to your home. 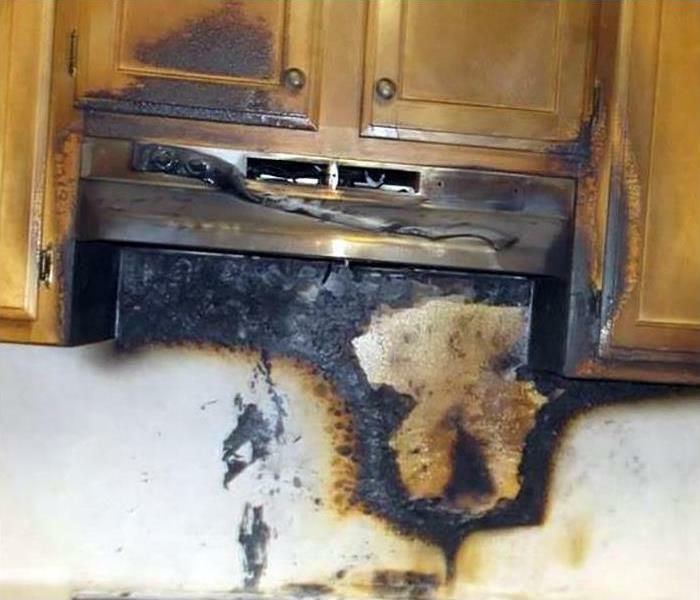 When a fire damage emergency happens, you need the team at SERVPRO! 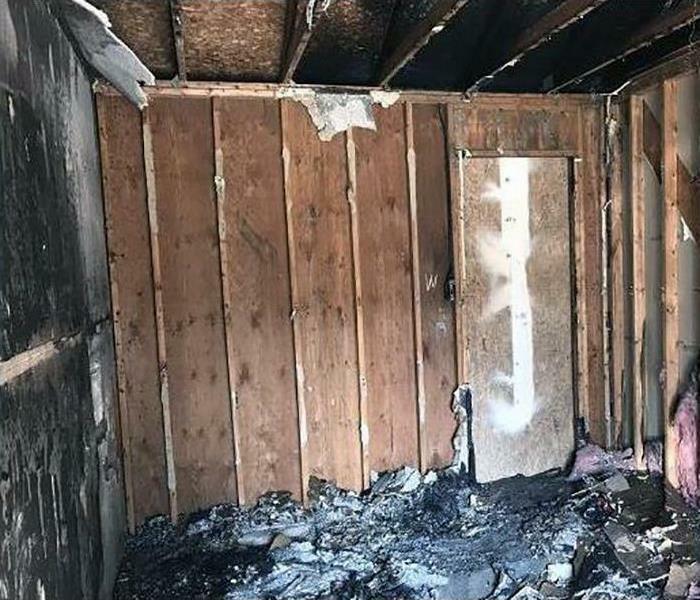 We have the fire damage experience, state-of-the-art equipment, training, and IICRC certifications needed to return your home to pre-fire condition. SERVPRO of Fayetteville / Springdale is available 24/7, locally owned and operated, and Faster to Any Size Disaster. A storm can cause a lot of damage to your home, and our team can handle any size disaster. 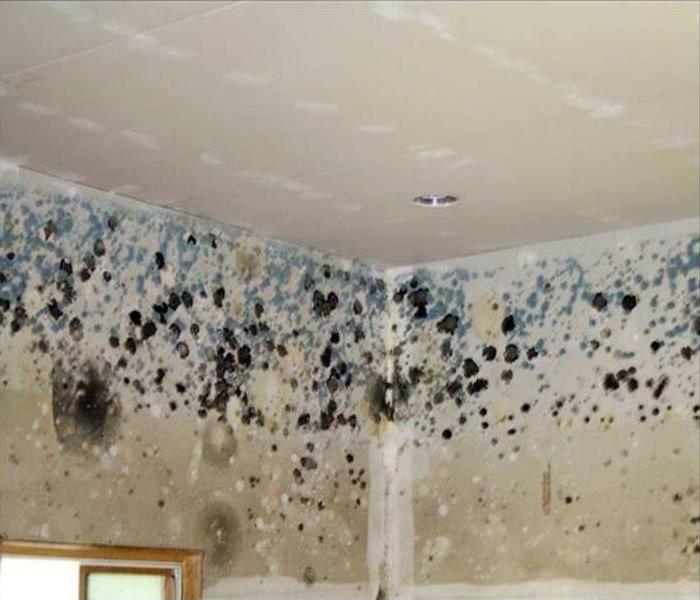 Our team has the storm damage experience, specialized equipment, training, and IICRC certifications needed to eradicate your mold infestation. SERVPRO of Fayetteville / Springdale is locally owned and operated, available 24/7, and Faster to Any Size Disaster. 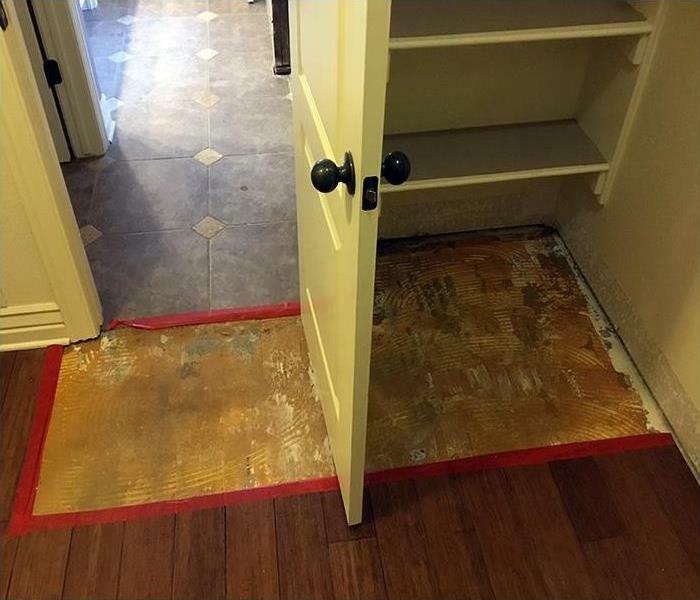 "When we had major water damage in our home Danny Fields was the first phone call. He and his team at the best. Excellent service and repair." Thank you Andy Wilson for your gratifying comments. Jared Gage, with Lewis & Clark Outfitters, is pictured here with Keith Moore receiving his ERP profile. With his Emergeny Ready Profile, he now has quick reference of what to do, how to do it, and who to call in event a disaster strikes his property. The ERP app is available on the app store and the android market. Visit https://ready.SERVPRO.com/ for more information or to register for an ERP! SERVPRO of Fayetteville / Springdale is available 24/7 and will quickly respond to your storm damage emergency. 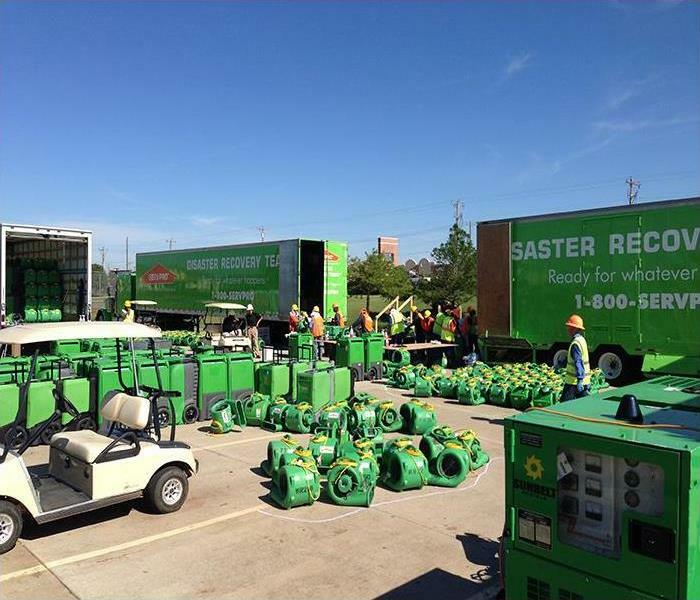 Our technicians have the state-of-the-art equipment and training required to tackle any size disaster. SERVPRO is a leader in the restoration industry, locally owned and operated, and Faster to Any Size Disaster! Our SERVPRO team was happy to present Chris Decker with his very own Emergency Ready Plan profile. Chris is the Director of Special Events and Programming of the Fayetteville Chamber of Commerce. He understands the importance of having a plan of action when it comes to his property. Downloading an ERP profile for your residential or commercial property will put you ahead of the game when disaster strikes. Put help in the palm of your hand! 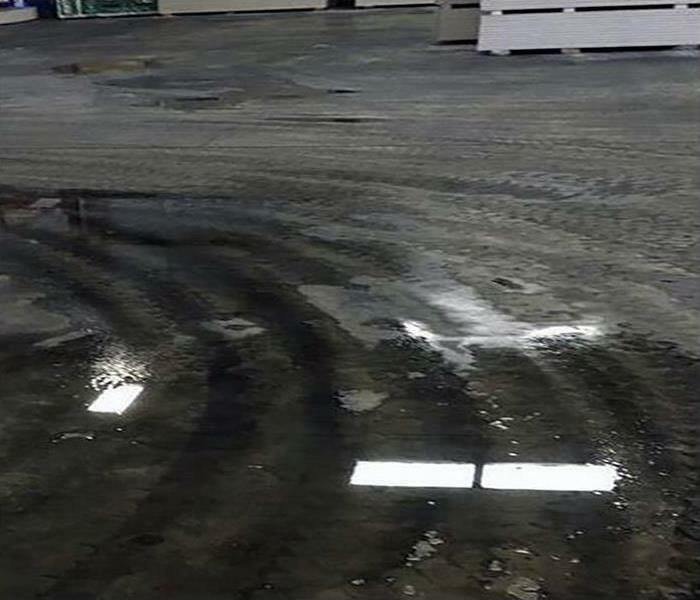 As a business owner, commercial water damage can be very intimidating, but SERVPRO has your back. 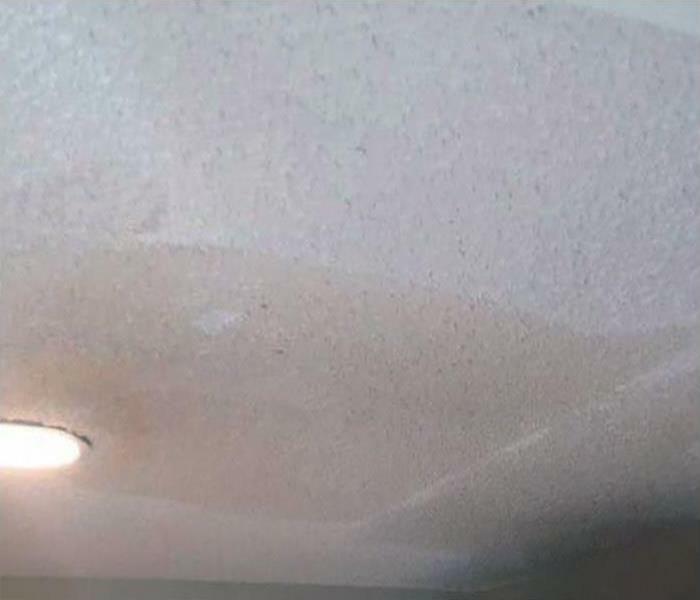 Our crew of highly trained and certified water damage restoration specialists will use advanced water inspection, extraction, and drying equipment to restore your property. We are locally owned and operated, a leader in the water restoration industry, and We’re Here to Help! When a storm hits your property, there is only one company to call, and that's SERVPRO. As leaders in the storm damage industry, our storm damage specialists have the advanced training, specialized equipment, and expertise to restore your property to pre-damage condition. Our team will provide you with professional and top-notch service. We’re Here to Help! 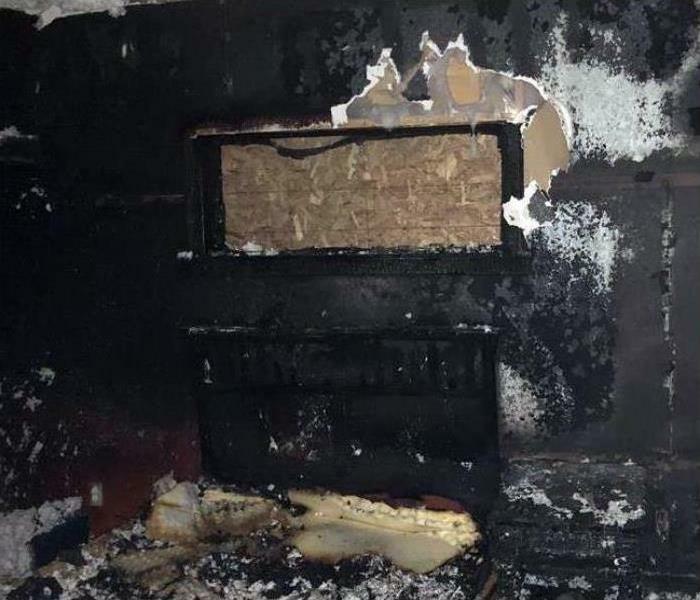 A fire comes with its own set of problems that include soot-covered parts of your property, bad odors, and keepsakes and belongings that require specialized care. Do not worry because SERVPRO has you covered. We have extensive training, specialized equipment, and a variety of cleaning techniques to restore your property to pre-damage condition. We even remove those bad odors that linger after a fire. You can count on our team for all your restoration needs! 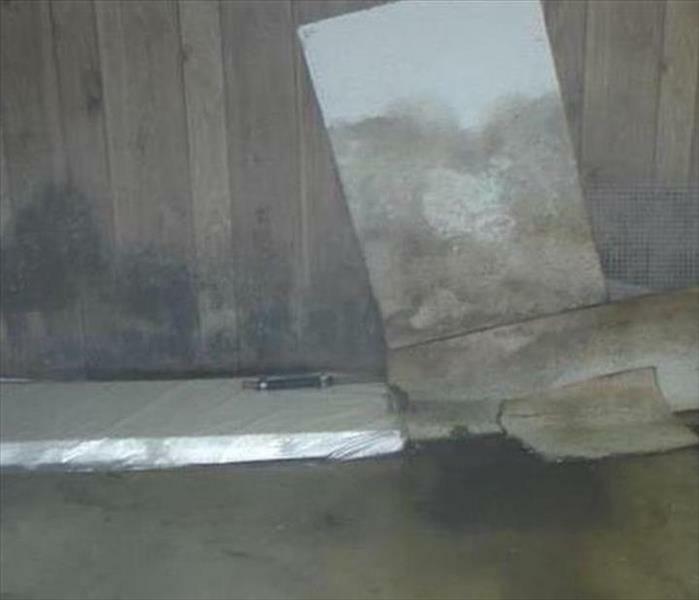 Flooded basements with contaminated Black Water require particular extraction protocols to ensure the safe transfer of the stormwater to holding tanks per EPA mandates. SERVPRO has the skilled technicians and equipment to perform these services. Count on us for help after a storm. 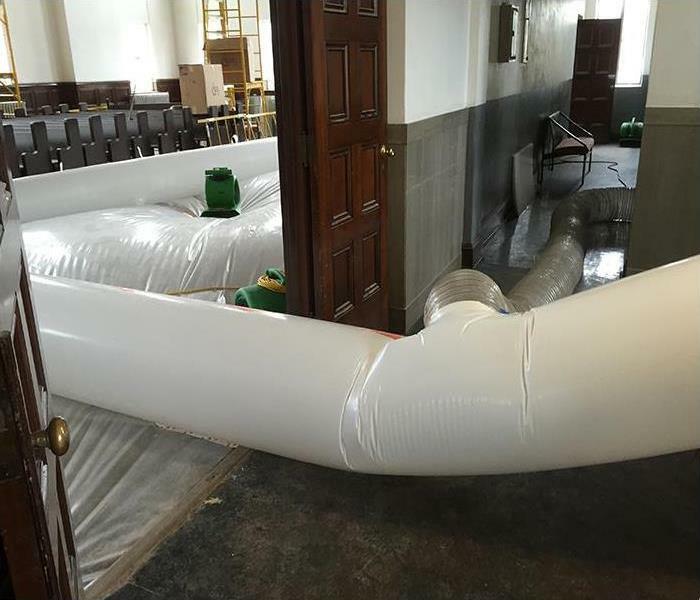 Our team has the equipment, training and experience to handle large commercial flooding or water damage emergencies. 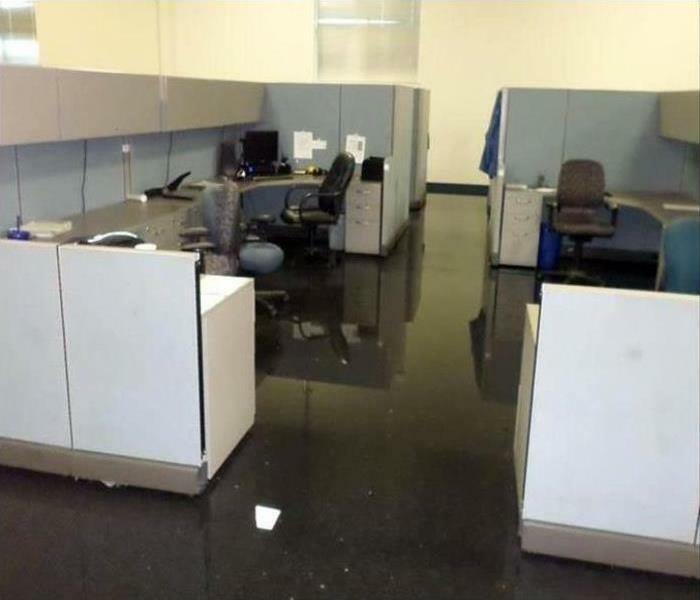 We are ready to help you recover from any size commercial water loss. For more information, call our office at 479-419-5544. SERVPRO of Fayetteville / Springdale is a trusted leader in the restoration industry. 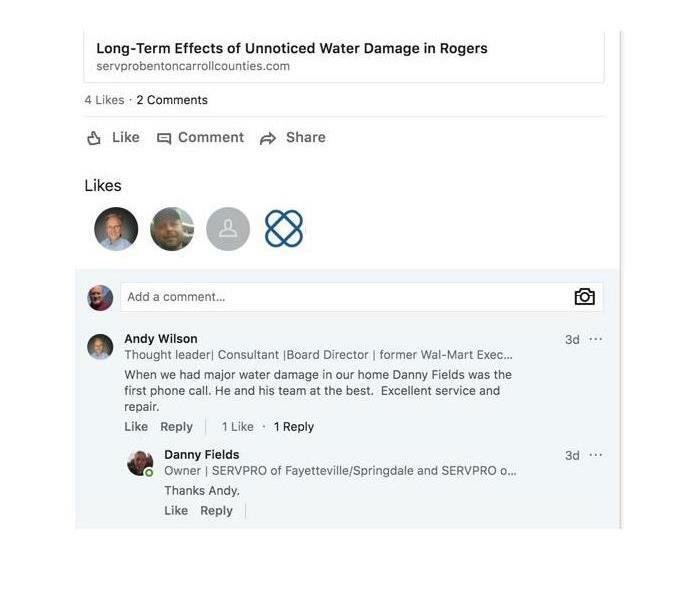 Our local team has the training and equipment to handle your water damage restoration needs in the Fayetteville and Springdale area. We extract the water and then dry your residential or commercial property. We use moisture monitoring equipment to effectively measure and document the drying process to ensure your property is dry. 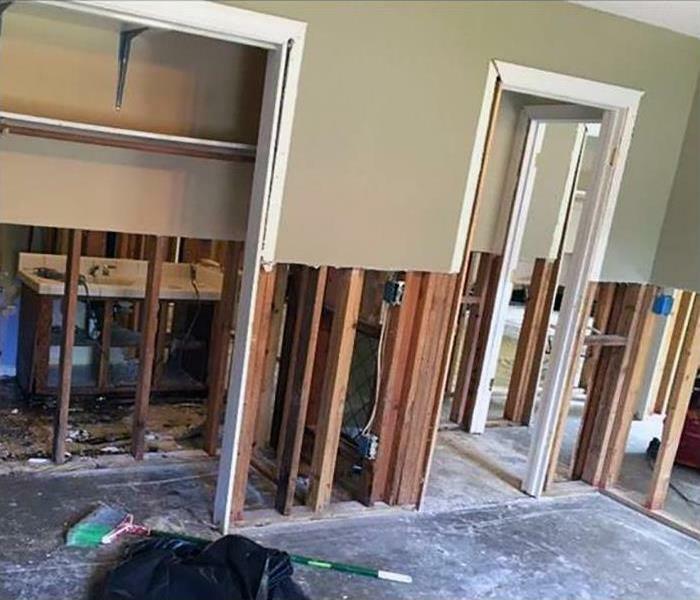 If you suffer a water damage emergency in Springdale or Fayetteville, call our team for a fast response. 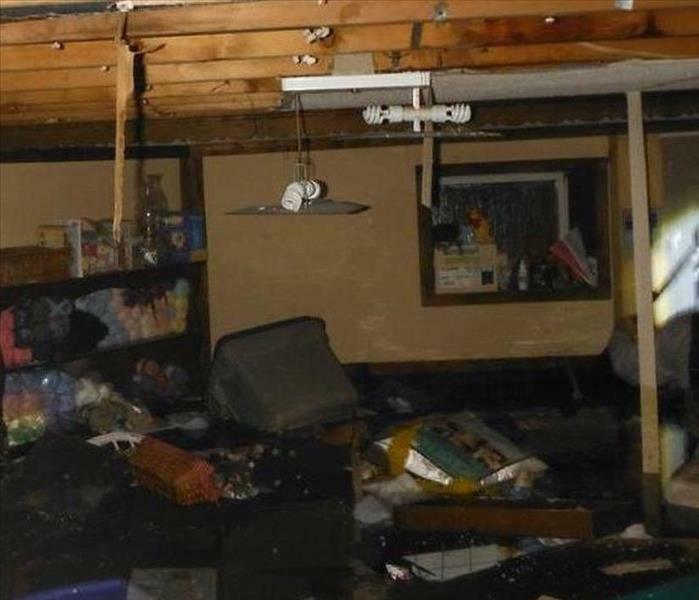 In this photo is an example of what can occur when fire damages an older home Fayetteville, AR. 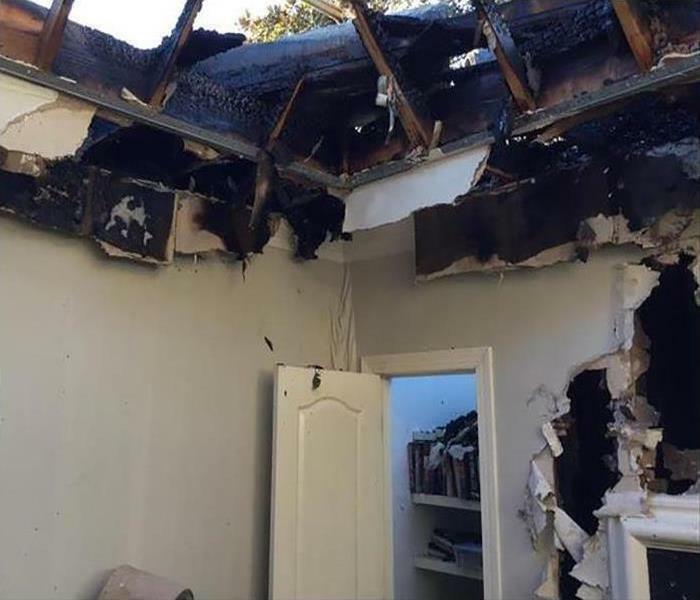 This older home suffered massive fire damage from a burning cigarette left on a sofa. 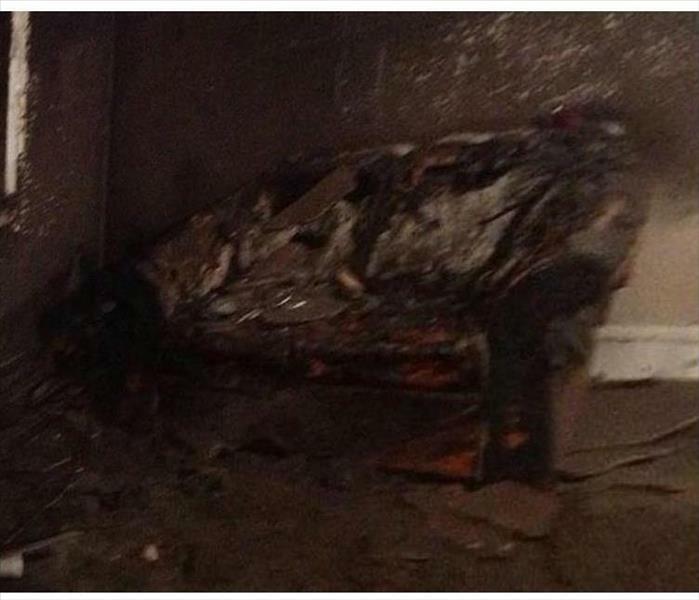 Pictured is the damaged sofa that would have to be discarded, along with the carpeted flooring, window treatments, fixtures and some building materials. Furnishings and building materials that cannot be cleaned, restored, and deodorized must be demolished and removed, and then rebuilt. 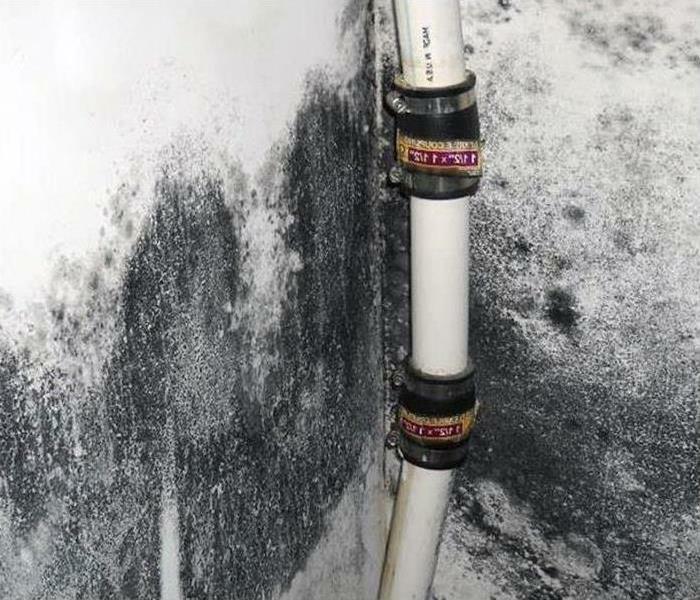 Humidity levels in Springdale, AR basements can be significantly higher than the rest of the home, which can increase the chances for mold growth. In this photo, mold colonies are growing on paneling and other areas. 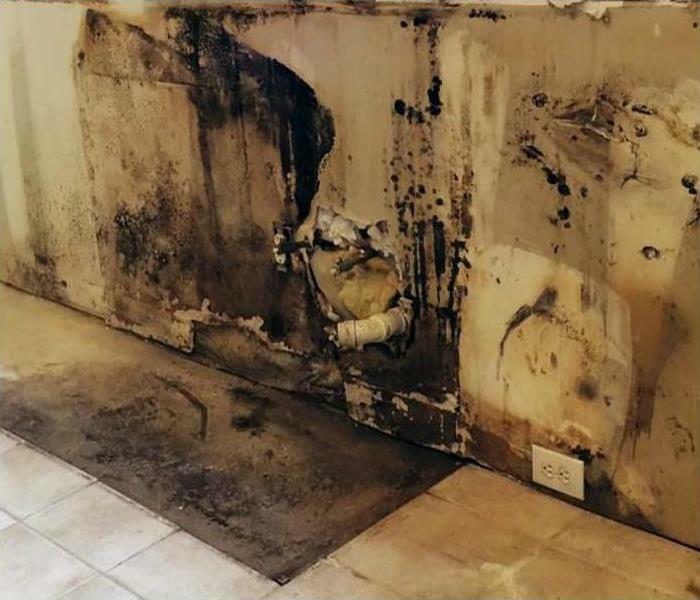 In a mold restoration we contain the affected area, use powerful LGR dehumidifiers to reduce humidity levels, and air scrubbers to reduce mold spores in the environment. The salvageable materials are then scrubbed, and the entire area is sanitized. Installing a conventional dehumidifier after the restoration can help prevent the mold from returning.